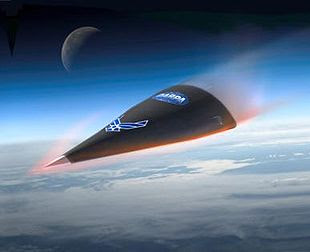 Falcon HTV-2, a hypersonic aircraft that's capable of flying 20 times the speed of sound making it the fastest plane on earth went missing during a test flight. It was the second time in a row, the Pentagon has lost contact with an experimental hypersonic vehicle over the Pacific, just minutes after it was launched from space. The flight of the Falcon Hypersonic Technology Vehicle 2 was hotly anticipated in military and aerospace circles. Ground controllers lost contact with the arrowhead-shaped plane less than half an hour after it took to the skies. Is it no co-incidence that the plane is basically a large black triangle? all airplanes are geometrically simplified triangles, sir. triangle ufos shot around the world are less acute than this seen in the video. i dont think this craft has anything to do with the majority of ufos being filmed globally. Doubt they'll be finding the black box on this one. This aircraft in testing can go pretty fast, but a lot of triangular UFOs witnessed can hover and can fly by at some pretty slow speeds and seem to be at a much larger scale then this craft. They can't even land the thing without losing communications with it. Fail.